Discover new ways to foster connection and engagement between leaders and employees at every level in your organization. More than ever before, employees in the modern workplace seek work environments that unlock creativity, make their lives more productive and fulfilling, and foster a sense of connection with their organizations mission and purpose. 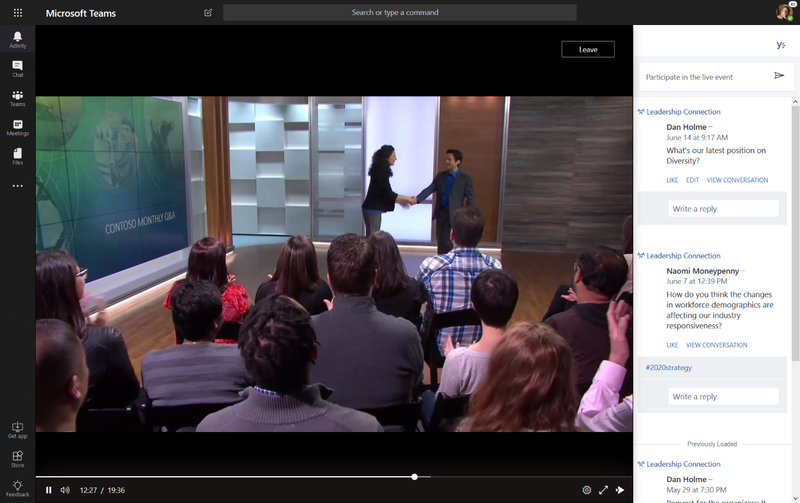 Microsoft 365 live events brings live video streaming to a new level, going beyond what was previously possible with Skype Meeting Broadcast. 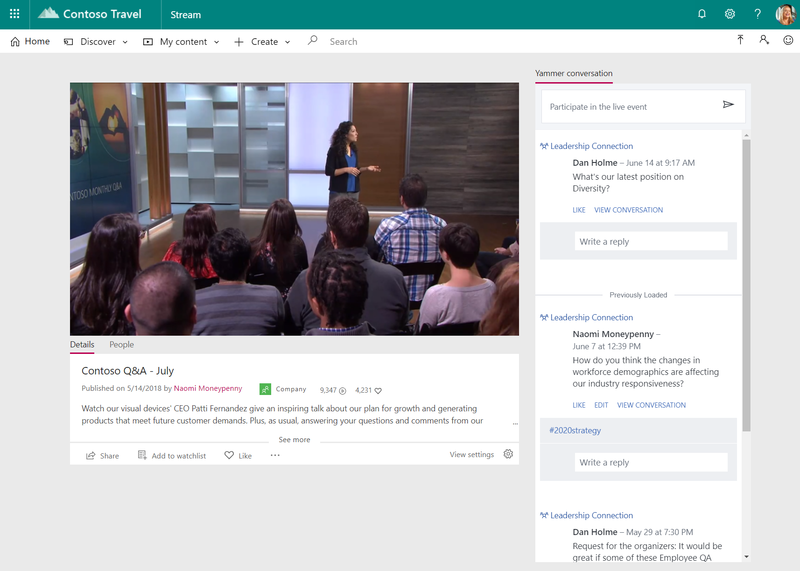 Live events in Microsoft 365 help to drive connection throughout the entire life cycle of engagement with attendees before, during, and after live events. 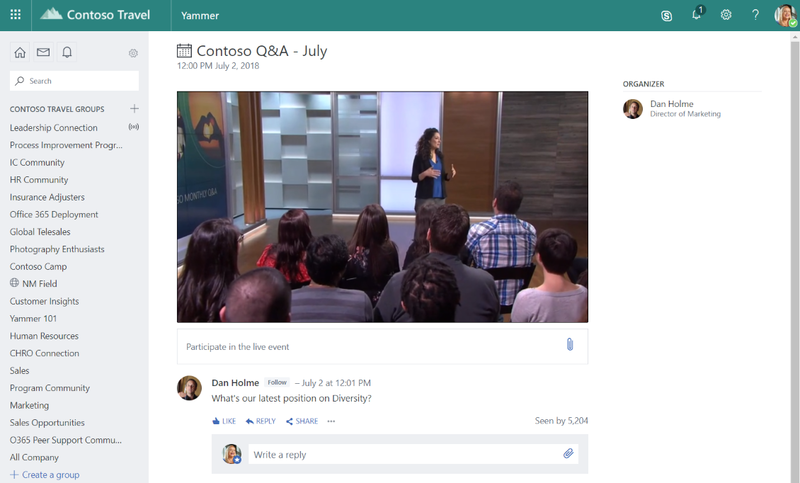 You can create a live event wherever your audience, team, or community resides, using Microsoft Stream, Microsoft Teams or Yammer. Attendees receive notifications and can participate in real time, with high-definition (HD) video and interactive discussion, using web, mobile, or desktop apps. For employees who are in different time zones or unable to attend live, the conversation keeps going so they still feel connected to leaders and peers, helping to overcome geographical or organizational boundaries. After an event, it’s easy to make the recording available on an event page, so people can watch the event on their own schedule and catch up quickly with powerful AI features that unlock the content of the event recording. The recording is automatically transcribed and detects changes in speakers, making it simple to search for content later. The event and recordings are powered by Microsoft Stream, the intelligent video service in Office 365. Depending on which service you create the live event from and event type selected there will be a different set of features available as a producer and as a viewer of the live event. The following table represents those feature differences at this current time. In the future as we enhance live events across Microsoft 365 we'll strive as much as possible to make the same features available from all the services. There are two production types supported by live events. With Teams production type (formerly known as Quick Start), you use Microsoft Teams to share your webcam, screen-share or invite other presenters just like a regular meeting. With the External app or device production type (formerly known as External Encoder), you connect a software or hardware encoder via RTMP(S).